I have been a collector for 35 years. This is one of the cars from my personal collection. See others at www.gccc.us. This is a VERY NICE Oldsmobile Toronado Custom Two Door Hardtop. As you can see by the condition of this beauty, this was the pride and joy of the one and only owner before the current collector. This car is getting very rare because 1971 was the first year for this body style and it's still a stunning body style 40 years later. It's also one of the few American Made Classic cars that came from the factory with front wheel drive. We also have the original eight track tape from Oldsmobile that came with the car when it was sold new! It's recently had a tune-up, a carb kit installed and new front and rear shocks were installed. ~~This BEAUTY has what appears to be the STRONG, ORIGINAL GROUND POUNDING (350 HP) 455 CID V8 in it and running extremely well; sounds good too with the factory dual exhaust system. This Toronado has great looks and GREAT power as well. There are not many of these left on the roads for sure and as a result, these vehicles have an appreciative group of owners any of which would be pleased to own this one. The suspension and drive line seem to be in good working order as well as the electrical system. The car also sports the original Oldsmobile stainless steel wheel covers and check out the whitewall radial tires. This vintage luxury car with Muscle car power is a good investment opportunity and it is priced right. This vehicle is in very good condition from top to bottom and from front to back. It will not disappoint someone looking for a good example of a sought after and hard to find collector car which is not seen at every stop light for sure. AGAIN, THIS IS A QUALITY CAR. If you have been looking but cannot find a Classic Toronado Custom look NO further because this is the one! The Original chrome and stainless on this car is BEAUTIFUL including the ORIGINAL front and rear chrome bumpers. This vehicle is in nice mechanical condition and it runs and drives VERY WELL! The vehicle is solid with respect to the overall mechanical condition as well as the overall cosmetic impression. 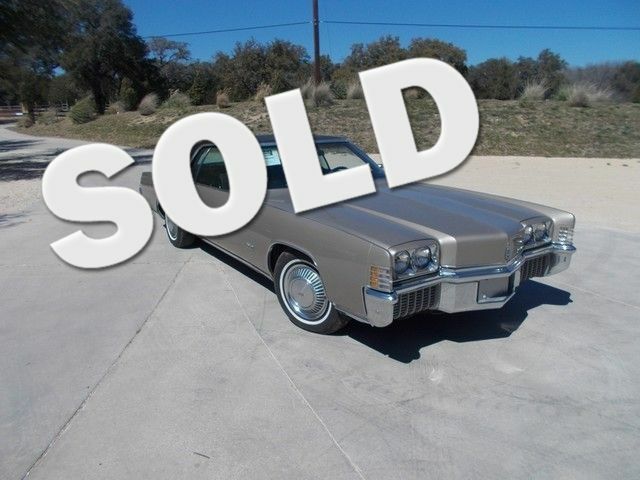 HISTORY Toronado grew larger and more formal in its first complete redo for 1971. The dash was now shared with other full-size Olds models, and a new Brougham interior included a 60/40 split front seat for the first time. A unique Toronado exclusive feature was a second set of taillights at the base of the rear window that worked with the brake lights and turn signals. Up front, Toronado featured what might best be described as grille less styling. Quad headlamps flanked a raised and projected center section of the broad hood, all set above a massive bumper. Air intake was accomplished via twin grilles set into the outer thirds of the bumper, a very distinctive touch. In back, one found a trunk lid with a raised and extended center portion that, in plain view, would have appeared to be a continuation of the jutting hood. Recessed rectan??gu? ?lar tail lamps sat low in niches created by the trunk lid and rear bumper. Toronado's interior came in for special attention with cut-pile carpeting and elegant fabrics and trim. Even the accelerator and brake pedals were color coordinated! Olds contended that the front seat, made of solid foam, was ""simple and sag proof."" The handsome instrument panel was composed of three sections. A central rectangle held speedometer, odometer, fuel gauge, and gearshift indicator. Flanking this were two larger rectangles. The one on the left contained climate-control levers, lighting and wiper/washer controls, and an air vent; the left one held the radio, cigar lighter, and another air vent. Shoulder room in this sumptuous interior measured more than five feet, and the floor was virtually flat, thanks to the front-wheel drive. Though still quite rare in America in 1971, front-wheel drive wasn't the only trump card the new Toro held. One particularly innovative feature: The taillights were supplemented by a pair of eye-level stop and signal lamps set in slots just below the rear window, a preview of today's high-mounted brake lights. A sophisticated new flow-through ventilation system exhausted interior air through louvers on the deck lid.